We're not ones to suggest there's such a thing as too much when it comes to homebuilding vehicles. But an eight-wheel "sports" car with dual Mazda rotary engines, Jaguar differentials and a rat's nest of unfinished business? Someone cry uncle. This Plains-state Frankenspeedster, comes courtesy of, where else, a certain online auction site where the seller provides one of the most half-hearted pitches we've seen for their "Costum made car from scratch:"
This is a car that is hard to describe. 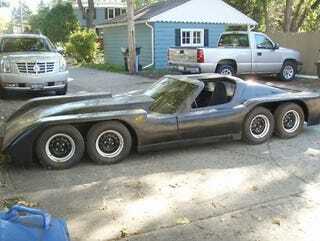 It is design to be a sports car with 8 wheels. the body is custom made of fiberglass the frame is steel tubing. there is no interior in it. the detentions are 204in long x 81in wide x 40in tall I don't know the weight of it. This car is all black. In addition to its welder's grip of the obvious, the car's mechanical parts list includes two "GM-Style" front suspensions, two Jaguar suspensions out back, the rotaries "put together" and a hodgepodge of other pieces, including a few Corvette parts.